While these are not all necessarily news events and they didn’t all generate headlines, they caught our eye and, in some cases, provided data we’ll be using for some time to come. The whole food, plant-based diet continues to gain popularity as public figures and science promote the favorable consequences of this healthful lifestyle. This position paper wasn’t a first-time effort. It was an update of a position paper from 2009. But it makes a big difference to have a major nutrition organization officially label well-planned vegan diets as not only safe for all ages but also a source for an array of health benefits. It was great to see the update and, we thought, very well done by the authors, Vesanto Melina, Winston Craig, and Susan Levin. And if you think this isn’t a big deal, imagine if our major nutrition institutions came out with a message like this German group did. It would be a disaster for our efforts to get people to move toward more plant-based nutrition. 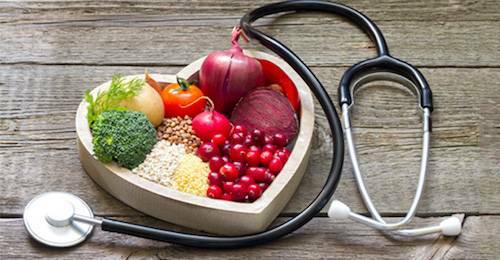 In a cohort study looking at coronary artery disease, lifestyle and genes, researchers found that individuals with 3-4 lifestyle factors had about a 50% reduction in risk compared to those with 0-1 lifestyle factors. This was true across all levels of genetic risk. The 4 lifestyle behaviors: not smoking, BMI <30 (ie. being healthy weight or overweight, not obese), physical activity at least once a week, following ½ of the modest heart organization dietary recommendations. These are pretty low bars for a healthy diet and lifestyle. Adopting these factors, compared to those not following healthy lifestyles, was about as beneficial as having low genetic risk compared to having high genetic risk. If these modest goals lower risk by about 50% and had a similar range of effect as genetic risk, we’d love to see the study done with people following a whole-food, plant-based diet, exercising a lot more and having never smoked. It seems a good bet that lifestyle would absolutely dominate the effects of genetic risk. We’ve also heard about current and former NFL athletes like Griff Whalen and David Carter who have adopted plant-based diets. One study found that eating plant protein instead of animal protein cuts risk of death. An editorial in the American Journal of Clinical Nutrition made a compelling case that eating excess animal protein, particularly dairy protein, is a contributor to childhood obesity and related diseases. Women who get diabetes during pregnancy (gestational diabetes) are at a significantly higher risk of later getting full blown type 2 diabetes is they eat a low-carb dietary pattern, particularly if it is rich in animal protein and fat. And postmenopausal women who consume the most animal protein are at a 60% increased risk of getting heart failure compared to those who consume the least animal protein. A study of health-conscious people in Oxford found that vegetarians and vegans unfortunately eat just as much fat and sugar as omnivores. This is not a knock on vegans or veganism, which incorporates important lifestyle and food ideas that go far beyond nutrition and health. But we consistently have found that consuming added sugars and fats present a persistent challenge to achieving optimal health, for both omnivores and strict vegans. Added sugars are sugars and syrups that are added to foods or beverages when they are processed or prepared. Added sugars does not refer to whole foods like fruit. It’s too easy to get stuck in the animals vs. plants fight and forget about added fats and sugars, which present perhaps equally grave threats to most people’s health. A site deemed to be 780,000 years old included plant remains that human ancestors were using as food. A rich, wide variety of plant remains were found, including 14 species producing underground storage organs (ie. starchy plants, like tubers). The popular idea that the paleo diet was a starch-free, nearly carnivorous diet consisting of hunting wooly mammoths and deer is a long outdated public myth we should just dispense with. From this study and many others, it’s clear we consumed lots of plants in addition to whatever meat we ate. One of the great benefits of weight loss is often in insulin sensitivity, but this fascinating study found that merely consuming two servings of whey protein a day in addition to a standard low-calorie diet eliminated the benefit of weight loss. People lost weight but had no improvements in insulin sensitivity. Many people commonly try to lose weight by eating protein bars and shakes and protein-based meal replacements. Even if they lose weight, they may be sabotaging their efforts at improving metabolic health if they consume extra protein, particularly whey protein. These new recommendations have found allies in Hollywood. Arnold Schwarzenegger and James Cameron as well as Chinese film star Li Bingbing who are featured in public service announcements in collaboration with environmental organization WildAid and the Chinese government. These PSAs encourage the Chinese public to reduce their meat intake to improve health and avoid global warming. A group of researchers at Oxford University published an analysis comparing the future effects of three different dietary scenarios out to the year 2050. They considered effects on global human mortality, greenhouse gas emissions, and economic value of health and environmental benefits. The three dietary patterns were 1) a moderate pattern following dietary guidelines 2) vegetarian and 3) vegan. Global adoption of any of the three dietary scenarios would be beneficial, but the more plant-based the diet, the greater the benefit. Global adoption of a vegan diet was projected to avoid 8.1 million deaths per year and reduce mortality by 10% for all causes by 2050. Vegan diets were projected to reduce food-related greenhouse gas emissions by 70% of those predicted in 2050. A vegan diet was projected to save $1067 billion USD per year in health-related costs (3.3% of the predicted global GDP) and $570 billion USD per year due to avoided environmental harm. Thomas M. Campbell, MD is medical director of the T. Colin Campbell Center for Nutrition Studies, co-author of The China Study and author of The China Study Solution. He is co-founder and clinical director of the groundbreaking UR Program for Nutrition in Medicine. Their next 7 Day Finger Lakes Immersion at the beautiful Woodcliff Hotel and Spa will start July 23rd in Rochester, NY.